Health care is a major consideration when moving overseas. Panama’s overall health care is affordable and good. But there are a number of factors to keep in mind. In this post, I cover the following points. Panama has 3 health care systems; 2 are government run and 1 is private. The same doctors work in both the public and private systems. Panamanian law requires that doctors in the private sector also have office hours in the public or social security hospital. I am actually not sure of all the ins and outs of that law or if it applies to all doctors, but all the doctors I have spoken to about it say they are required to spend part of their time in the public hospitals or CSS hospitals or clinics. Most expats will primarily use the private system. The private system is more expensive, but it is alot faster, and you will more often find doctors who speak English. Although the private system is more expensive, relative to health care in the US, it is affordable. In Chiriqui, where we live, you can (and we have) use all 3 systems. That is not the case everywhere. For instance in Panama City if you don’t have coverage by the Panama social security system you cannot go to the social security hospital, you have to go to either a public or private hospital. For more information on Panama’s health care system, visit this post. 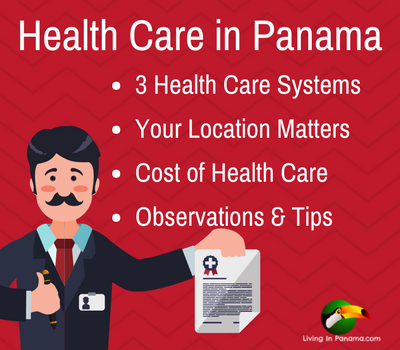 Your location in Panama will determine your health care options and access. If you choose to live off the beaten path and far from a major city, you are also choosing less access to good health care. The gold standard of health care in Panama is found in Panama City. Panama City has an excellent and mature health care system. Health care in David, the 2nd largest city in Panama, is very good and is steadily improving. However, the more remote you are from David or Panama City, the more likely you won’t have immediate access to good health care. This is the case for both private and public care. Health care costs in Panama are dramatically less than in the USA and some other 1st world countries. Many medical procedures are 1/2 to 1/4th the cost of the same procedures in the USA. This is not the place to get into a discussion about why health care is so expensive in the States. But many of the reasons that spring to mind, do not exist in Panama. Which is why health care costs here are so much less expensive. The cost of your health care will depend upon which of the 3 systems you will be using. In a private hospital MRI’s are around $500. A facelift can be done for about $1,700. Both are much less than in the 1st world. A cost to trip to the ER can cost you around $100 in a private hospital. We went to the ER at our local Social Security hospital and it cost 50 cents. You can read about that experience here. Prescriptions. More expensive prescriptions are often not available in the public and CSS systems. Keep in mind, that prescription drugs can be more expensive in Panama than in the USA or other western countries. Some people get their prescription when they visit their homeland. Appointments mean nothing. The receptionist will give you an appointment. You show up and wait. You will get more and more impatient as people keep filing in before you. No matter what you are told, Panama works on a first come, first serve basis. A good question to ask is, what time do you recommend I show up? Prepare to wait. It’s just the way things are. There are exceptions to this rule, but it is better to pleasantly surprised than think you can rely an appointment time. Then again, sometimes you will be scooted to the front of the line for no reason, except maybe because you are an expat. Sanitation and aesthetics are not well-developed. This is most often seen in salud clinics and Social Security hospitals. There seems to be some basic lack of concern about the passing of germs. We have seen a receptionist at a lab take a stool sample jar in her hand, put it on her desk, and immediately pick up her telephone. Gloves or plastic bags or wipes where not used in any part of that procedure. Also like everywhere else in central america, hot water is a rarity. But the lack of hot water is especially surprising in a hospital. Expect to be surprised. Like most of central america, the aesthetic is very different. Cluttered waiting rooms are common. Sometimes the whole medical facility can seem a bit grungy, especially in the public sector. It can be hard to be confident that although it is a bit grungy, that it is clean. Hospitals have visiting hours. They are strictly enforced. It is like going back in time. The doctor is often seen as a demi-god. This also means they are likely to act more sure of their treatment of your condition than they may actually be. You may want to use a resource like Epocrates Online to educate yourself on the drugs you have been prescribed. Check out where your doctor went to school. At the risk of sounding prejudiced, I will share the criteria we use when selecting a doctor in Panama. One factor I use when deciding to work with a health professional is where he or she was trained. I avoid professionals who have been exclusively trained in Panama. The Panama education system is terrible. I choose doctors or dentists with at least some training in Columbia, Mexico, the USA, or other places that offer decent training. I have noticed a big difference not only in the scope of what they know, but in both their desire to keep current in their profession and in how they treat you as a patient. The attitude of doctor as paternalistic demi-god is much more prevalent in people who have been trained exclusively in Panama. Drugs without prescriptions. Many medications that require a prescription in the USA are available over-the-counter in Panama. If you know the drug you want, ask the pharmacist if you can get it without a prescription. It will save you the trip to the doctor. Keep in mind that the drug you know is probably called something else in Spanish. Do a Google search or use Epocrates Online to find out its name in Panama. For many health issues, health insurance is not needed. Health care is very affordable in Panama. In fact, health care is so inexpensive in Panama, some people simply forgo health insurance. They simply pay out of pocket. That is what we have done. However, it is a somewhat risky choice. If you need open heart surgery or major cancer treatments, that is costly anywhere. Granted it is cheaper in Panama, but it still going to set you back quite a bit. Given that health care insurance is pretty affordable, I would recommend that most people buy it. Not sure if you need health insurance? Read this post, should you get medical insurance in Panama? You will discover many options for health insurance in Panama. I have written detailed information about it. Please check out one of these posts below for more information. Health insurance coverage and information can change. I suggest you go to the following groups to ask questions, get recommendation, and to find out changes to the insurance landscape in Panama. For more information, visit the ExPat Health Care Yahoo group regarding health care for gringos in Latin America. The insurance information on the site seems outdated. However it seems like a good source for recommendations for doctors, dentists, and the availability of specific procedures or treatments. Other groups like, Expats in Panama, Gringos in David and Americans Living In Panama, are good places to discover more about the current realities of health care and insurance in Panama. To find answers to other frequently asked questions click here. Moving to Panama? You may like to look at our Moving To Panama Checklist.